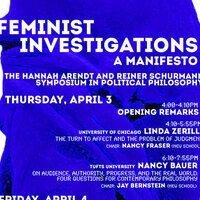 The New School for Social Research’s Philosophy Department is sponsoring The Hannah Arendt/Reiner Schurmann Memorial Symposium entitled “Feminist Investigations: A Manifesto,” held this semester on two consecutive days, with the participation of American and foreign scholars. The continuing relevance of feminism is evident to anyone who is paying attention. But is not unreasonable to ask whether today feminist theory has abandoned its historic aim of making sense of women’s experiences and giving expression to women’s voices. In some of its most prominent contemporary guises – those most closely associated with post-structuralism and its aftermath – feminist theory veers toward getting lost in theorizing that by its own lights lacks the authority to do justice to women’s lives. In yet other familiar guises – those most closely associated with the projects of analytic philosophy – feminist theory slides into quasi-scientific investigations that antecedently abandon the project of exploring women’s experiences. The premise of this conference is that feminist theory stands in need of a revival. A central unifying theme of the individual talks – which engage with a wide range of figures and debates in philosophy, political theory and literary studies – is that a good place to look for resources is in the tradition of thought about language, strongly associated with the writings of thinkers such as Wittgenstein, Austin and Cavell, that is sometimes referred to as ordinary language philosophy. For full schedule, visit the conference website.